It has been said that John Henry Newman "stands at the threshold of the new age as a Christian Socrates, the pioneer of a new philosophy of the individual person and personal life." Newman's personalism is found in the way he contrasts the "theological intellect" and the "religious imagination." Newman pleads for the latter when he famously says, in words that John F. Crosby takes as the motto of his book, "I am far from denying the real force of the arguments in proof of a God...but these do not warm me or enlighten me; they do not take away the winter of my desolation, or make the buds unfold and the leaves grow within me, and my moral being rejoice." 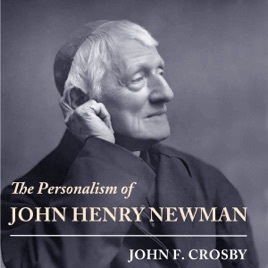 In The Personalism of John Henry Newman, Crosby tells the listener how Newman finds the life-giving religious knowledge that he seeks. He explores the "heart" in Newman and explains what Newman was saying when he chose as his cardinal's motto, cor ad cor loquitur (heart speaks to heart). He explains what Newman means in saying that religious truth is transmitted not by argument but by "personal influence."